Data is transformative. The ability to turn data into breakthrough insights is foundational to remain relevant in an increasingly competitive market. To help our customers deliver fast insights from exponentially growing data, today we are announcing the general availability of the Compute Optimized Gen2 tier of Azure SQL Data Warehouse. With this performance optimized tier, we are bringing the best of Microsoft software and hardware innovations to dramatically accelerate query performance and concurrency for our customers. 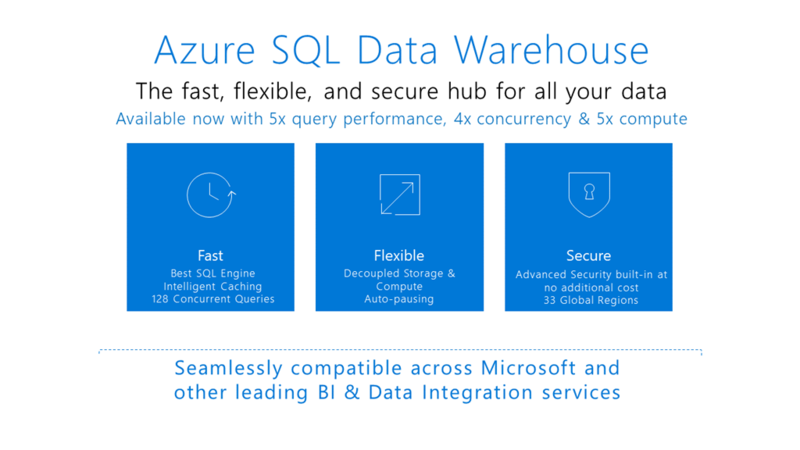 We launched Azure SQL Data Warehouse three years ago to make a powerful SQL based MPP (massively parallel processing) architecture data warehousing accessible to all. It was the first data warehouse that helped customers reduce costs by enabling them to scale compute and storage independently, and by offering pause and resume capabilities. This flexibility, combined with fast query performance, comprehensive data security, and governance capabilities has led to adoption by thousands of customers like Adobe, Toshiba, and LG Electronics. 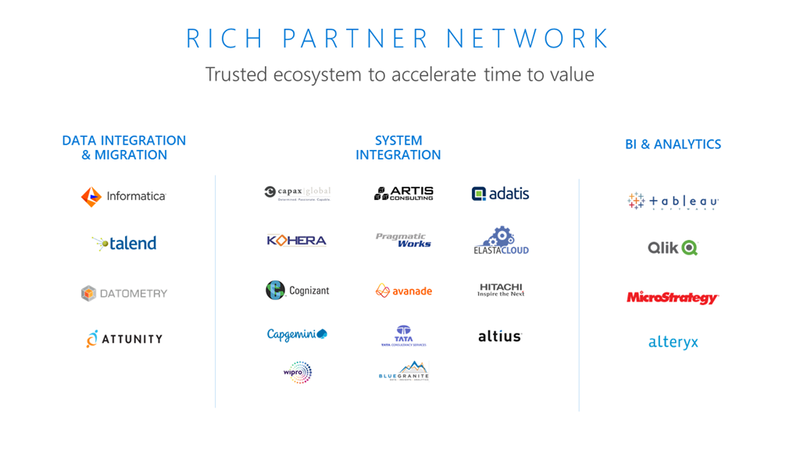 To keep up with customer demand, we have expanded the service to 33 Azure regions and it is now the most globally available of all cloud data warehouse services. Azure SQL Data Warehouse Compute Optimized Gen2 tier sets new performance standards for cloud data warehousing. Customers now get up to 5 times better query performance, 4 times more concurrency, and 5 times higher computing power compared to the current generation. It can now serve 128 concurrent queries from a single cluster, the highest of any cloud data warehousing service. Powering these performance gains is adaptive caching technology that understands where data needs to be and when it needs to be there for the best possible performance. Azure SQL Data Warehouse takes a blended approach of using remote storage in combination with a fast SSD cache layer (using NVMes) that places data next to compute based on user access patterns and frequency. We have also added Transparent Data Encryption with customer-managed keys to keep your data truly in your control. Customers such as DriveTime, a leading used car retailer in the US, are taking advantage of the new tier to significantly improve performance while lowering their costs. With its native integration with Azure Databricks, Azure Data Factory, Blob Storage and Power BI, Azure SQL Data Warehouse allows customers to build new analytics solutions to support modern data warehousing, advanced analytics, and real-time analytics scenarios. Azure SQL Data Warehouse also works with leading data integration and business intelligence solutions such as Informatica, Talend, Tableau, MicroStrategy, Qlik, and Alteryx. Additionally, we have invested in partnerships with Datometry and Attunity to enable customers to simplify the migration of on-premises data warehouse to the cloud. These ecosystem investments allow our customers to build upon their existing infrastructure and significantly accelerate time to value for powerful analytics solutions. See Azure SQL Data Warehouse Compute Optimized Gen2 tier in action in this Microsoft Mechanics video. Read about the key capabilities and features of Azure SQL Data Warehouse Compute Optimized Gen2 tier. Discover how we built the Adaptive Cache for Azure SQL Data Warehouse Compute Optimized Gen2 tier.